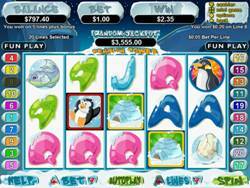 Penguin Power Slot Information, Screenshots and which online casinos offer Penguin Power Slot for Play. Can you brave the cold and win the jackpot? Penguin Power Slot is a 5 Reel, 20 Payline Real-Series Video slot with a Progressive Jackpot, Multipliers and Free Spins. The theme is about playful penguins and other arctic creatures in their natural habitat. There is snow all around, a great holiday atmosphere and cute, generous penguins. The Penguin, Baby Penguin, Seal, Fish, Sea Lion, Egg, Igloo and high value cards from Nine to Ace. Coin size ranges from 0.01 to 5.00. To increase the chances of winning it’s recommended to play on all 20 paylines where the bet amount can start from 0.20 up to 100.00 per spin. The Wild Baby Penguins will only appear on reels 2, 3 and 4. The Wild will substitute for any other symbol to help complete a winning combination. The Baby Penguin is also the Multiplier symbol and payouts will be doubled when the Wild symbol appears in a winning combination. The wild symbol cannot substitute for the Scatter symbol. Land a minimum of 2 Igloos anywhere on the 5 reels to trigger a winning payout. Land 3 or more Scatter symbols to activate the Penguin Slide Feature offering up to 25 Free spins. Land all 5 Penguins on an active payline to win 2 500 coins for a 1 coin per line spin. Players can adjust the coin values according to their budget. .
Penguin Power Slot offers extremely lively music, crisp graphics and a fun winter wonderland atmosphere! Enjoy the warmth of your home while playing in this icy cold environment.